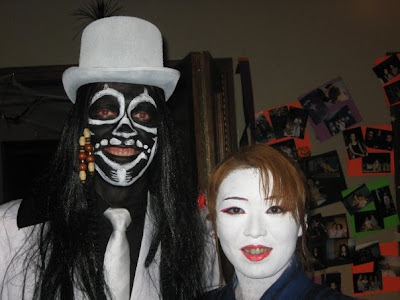 MB couldn't resist posting this pic of first born son and girlfriend Mami taken at a Halloween party on 1st November. FBS hired a white suit and wig and managed to look quite grotesque. Mami did an amazing job with the face paint. Of course the white suit got black face paint on it, however it was water soluble but to be on the safe side FBS took the suit to a local dry cleaners (5 Star Cleaners), who managed to get the face paint out but stained the suit all over with something else. FBS took it back to the costume hire who rejected it, so it was back to the dry cleaners. FBS mentioned that when he went back the counter staff were drinking cans of premixed Bundy & Cokes, even had a six pack on the counter, sort of gives one an idea of the calibre of these cleaners. MB became involved when FBS was working and couldn't pick up the suit in order to drop it back to the costume hire, so she dropped in and picked up the suit after it's 2nd clean. The cleaning was a disaster so MB decided to consult with another cleaners, Alsco, and discovered the most wonderful cleaner, Ray. Ray has cleaned for over 40 years, mostly in London. He took one look at the suit and explained that it had been cleaned in dirty spirit. Ray said to give him two days and he'd have it like new. A mere 6 hours later he called MB and advised the suit was ready! Sure enough it was spotlessly clean and Ray had even starched it. Amazingly Ray refused to charge for the clean, saying that FBS has been cheated. Due to Ray's professionalism and generosity a very negative experience had a wonderful outcome. How many Rays does one encounter? He is a true gentleman.